More great satire from The Onion. PASADENA, CA—Barely 72 hours after the landing of its Mars rover, NASA officials announced Thursday that their mission had ended, as Curiosity’s two-gigabyte memory card was now filled to capacity. “Well, that’s that, folks,” said chief scientist John Grotzinger, explaining that after Curiosity’s Mars Descent Imager took an especially high-resolution JPEG of the Aeolis Mons mountain, the $2.5-billion rover’s SanDisk card only had 0.03 GB of space remaining. “Honestly, we thought two gigs would be more than enough. That’s like a 1,000 pictures, right? I guess we probably should have deleted those old Hubble photos off there before the mission.” Grotzinger confirmed that even if the rover had been equipped with a larger memory card, it likely would have had only enough power for a few more hours of exploration before it had to return to Earth to have its battery recharged. 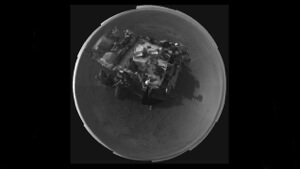 —NASA Calls It A Mission As Curiosity Rover Fills Up Whole 2-Gigabyte Memory Card | The Onion – America’s Finest News Source. 10 Aug 2012 in Amusing, Current_Events, Design, Science, Technology.